I am writing you with an Update on the Cincinnati Queens Rising Event originally set for March 2019. We had to postpone because of weather and travel risks of the students coming from Missouri. So, we postponed until April 5-6, 2019. On Friday April 5, 2018---We are putting together a community conversation involving students, around the topic of family, community Africana Melanated Womanism and the impact of Feminism on our struggle. This would happen on Friday. Saturday is an all day opportunity, with the banquet and speaking event to be on Saturday evening. 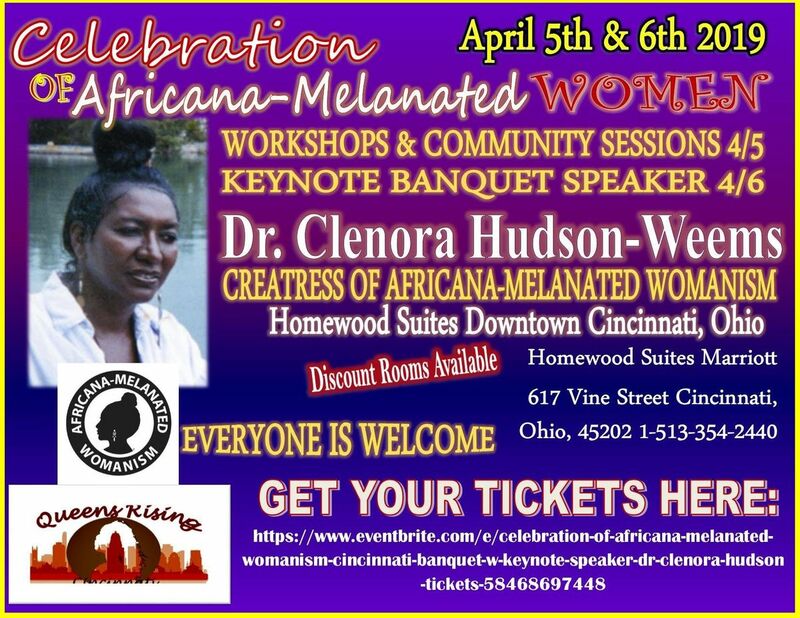 Also on Saturday we will have the honor of presenting the FIRST Africana-Melanated Womanist Awards here in Cincinnati, Ohio. This is definitely a historic event. Queens Rising is a grassroots group of Africana-Melanated Women. We share the common bond of raising our families and communities in the city of Cincinnati Ohio. Despite our personal struggles, we still recognize that we are strongest together; and it is our goal to rebuild the Village, which includes our Men, Women and Youth. We are not funded by any foundations. We rely on the kindness and generosity that comes from within the community. This is not just an event, it is a move to solidify our movement. We are the holders of the destiny of our community, families and friends. WE are always stronger together and we are looking forward to bringing our message of unity to other cities, groups & organizations. 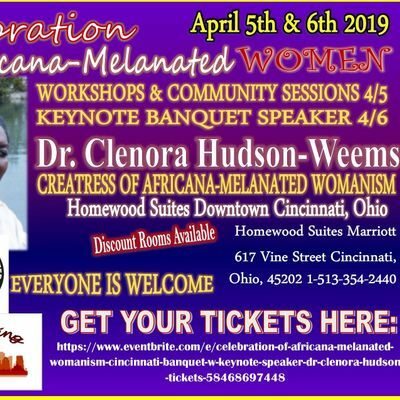 African Melanated-Womanism (AMW) is going to change the world, and we are the glue holding the communal foundation together. We have a comprehensive approach to developing community allows us to focus on specific issues, while building on our current assets. Each CommUNITY should look at this example and tailor it to fit their own needs and approach. This can work to do 3 things 1. Unify us around specific goals 2. Give us several platforms to work from so that many people can be included in its success, no matter what their education, profession or status. 3. Give us a general starting point, that can immediately begin to uplift the current conditions in our communities, no matter where we are. Thank you for your time and commitment to the uplifting the Africana-Melanated Village. See you in Cincinnati April 5-6, 2019. Please get your tickets in advance. Banquet and Speakers Event entrance at the door will be 30.00.